Obtain quick and easy access to information on DC and AC motors, various types of manual, magnetic, and electronic controls, and the installation and maintenance functions of each. 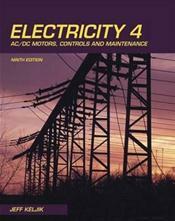 Updated to the 2008 National Electrical Code and featuring safety references to the most current OSHA Safe Work policies, Electricity 4: AC/DC Motors, Controls, and Maintenance, 9th Edition provides practical, hands-on information to get the electrical system operating as well as the theory of "why" the system works to aid in troubleshooting. The Ninth Edition features material on Variable Frequency Drives (VFDs) and newer controls for servo and small motors. Current practices and equipment have also been added to the Maintenance section to better enable readers to troubleshoot motors and control problems.